Well, the team at Kleenheat HQ is taking a big deep breath as we wrap up a massive summer of prizes thanks to our Super Mega Summer Scorchers Giveaway. We’re passionate about supporting local and proud to be the energy behind the women’s Perth Scorchers, so this summer we celebrated our support by giving away huge prizes. Yep, our Super Mega Summer Scorchers Giveaway had it all: a $20,000 Aussie getaway to be won, summer barbecue packs flying out the door and a stack of Perth Scorchers prizes snapped up across the summer. Thanks to everyone who got into the spirit of our summer competition by submitting their entries, sharing the news with friends and family, or joining the fun with our big blue ball at locations across Perth. Huge congratulations to Julie of Coodanup – major prize winner in our Super Mega Summer Scorchers Giveaway! Julie and three lucky travel buddies can now look forward to a huge $20,000 Aussie getaway to her chosen destination, Tasmania, where they’ll have the chance to reunite with family and friends while soaking up the sights, sounds and flavours of Australia’s island wilderness. Enjoy your trip, Julie! Summer entertaining got a whole lot easier for eight lucky winners in our Super Mega Summer Scorchers Giveaway. 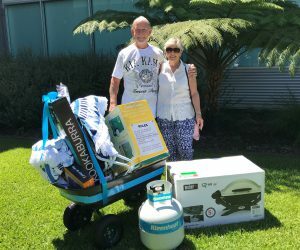 Each winner scored a shiny new barbecue pack including a Weber Baby-Q, cricket cooler, beach chairs, Kleenheat Kwik-Gas and heaps more. Across the summer we also gave Kleenheat customers the chance to win a stack of exclusive prizes including tickets to Perth Scorchers home matches, signed merchandise, Scorchers match-day experiences and heaps more. Thanks to customers who got behind our Super Mega Summer Scorchers Giveaway and congratulations to all our winners! Partnering with the Perth Scorchers is a natural fit: we both know the value of healthy competition and share an ongoing commitment to promoting diversity and inclusion. While some big eastern states energy companies are trying to get runs on the board in WA, our focus on delivering real ongoing value to local households remains unchanged. Kleenheat’s a proud WA born and bred company with a commitment to our home state, which means we’re always on the lookout for new opportunities to bring better value to those who choose to support local. A profile of the best in Perth. Review to win! Kleenheat / Blog / Competitions / Wrapping up a scorching summer of Kleenheat giveaways!